How do generators work? What is electricity? How does an electric generator work? How does a home generator work? How does an inverter generator work? and so much more. Electricity is such an integral part of daily lives that we don’t even question it. But how many of us know where electricity comes from and how it actually works. There are so many people asking the question: how does a generator work? I suppose that’s because we depend on them so regularly. The power in our homes comes mostly from large generators. These days there’s a move toward alternative power generation methods like solar and wind. Even though we are relying on other forms of energy to supply the global power demand, conventional generators (usually coal powered), supply around 80% of the world’s electricity. Of course, there are times when grid power fails us and we have to rely on emergency power. Natural disasters and overload on the grid electricity supply will cause your household power (or Mains electricity) to go down. This is when people rely on portable generators to keep their homes functioning normally, our businesses open, and emergency services up and running. We also rely on portable generators to supply us with electricity when we are far away from a normal electricity supply. For recreational use, like camping and yachting, we require a portable generator if we want electricity to keep our level of comfort to that of which we’ve become accustomed. So this raises questions like how does a portable generator work and how to use a portable generator. Portable generators are not the only way to supply backup electricity. Inverters are quite common and these store power in batteries that are charged from household power or solar panels and then use the battery power to keep our appliances running when the power fails or we when have no access to the grid. So what is an inverter and how does an inverter work? Many portable generators, these days, use inverter technology to supply clean electricity that doesn’t harm our sensitive electronic equipment. So, there are a lot of people who want to know how an inverter generator works. With all these questions being important to so many of you, I’m going to set about explaining everything that you need to know about power generation. This article will explain electricity to you in a way that you can understand. Or, at least, I hope I’ll explain it in a manner that everyone can understand. We’ll look at generators and how they work, as well as inverters. Let’s start by understanding electricity, this will make it much easier to understand how we produce it, using a generator or some other kind of power source. Electrons are negatively charged particles that orbit an atom. There’s a balance between the positively charged protons in the nucleus of the atom and the electrons that surround them. Magnets work on electron energy and make it very easy for us to understand how electrons and protons work. I’m sure you’ll all remember your 7th-grade science teacher showing you how magnets attract and repel each other depending on whether you face the negative or positive poles against the same pole or the opposite pole. Poles of the same type will repel – positive will repel positive and the same for two negative poles. Opposite poles attract – positive will a attract negative and vice versa. In an atom, the negatively charged electrons repel each other – forcing them apart. At the same time, these electrons are attracted to the central, positively charged protons in the nucleus. This causes the electrons to form an orbit. As one electron forces another away from it, the nucleus pulls it inward. There’s a constant push and pull effect that keeps the electrons in motion. In some materials, like rubber or wood, the electrons are very stable and aren’t easily disturbed. Their orbit can’t be influenced too easily by outside forces. These materials are known as electric insulators. Other materials, like most metals, have electrons that can be easily manipulated. This means that the orbit of these electrons can be affected and their normal orbit can be changed. These materials are known as electric conductors. In nature, electrons are influenced by friction, causing them to become charged. The movement of water molecules in a cloud causes the atoms to rub up against each other and this energizes the electrons, known ionization – the effect of adding energy to a molecule. We can say that these electrons become restless or excited. They want to move out of their orbit because the balance is disturbed. In an ionized molecule, some electrons will have a greater charge than the other electrons that are orbiting the nucleus. So these electrons will repel the others with more energy, forcing them further away. There isn’t a strong conductor between a cloud and the earth (the air can conduct electricity but it needs more power than a metal conductor). So these electrons remain contained within the cloud in the form of potential or kinetic energy. This means they have the potential to create an electric current but remain static – hence the term static electricity. As soon as the chance arises, these electrons will break loose in the form of an electric current. This is when the potential difference becomes great enough. Potential difference is the potential for an electron to move from a place of negative charge to a place of positive or neutral charge. In the case of ionic water molecules in a cloud, the cloud is the place of negative charge and the earth is the neutral or positive point. As the ionic molecules in the cloud increases, so does the potential difference – meaning that their potential energy increases as more electrons become energized. At some point, the potential difference between the cloud and the earth will build up to a point where it’s great enough for the electricity to flow through the air to the earth in the form of an electric current. This, we experience as lightning. We measure the potential difference as voltage. A higher potential difference (volts) means that the electron energy needed to create a current has to be greater than a low voltage. Lightning has a very high voltage – in most cases, this voltage is too great to be measured. A high voltage needs less conductivity, so a high voltage can travel through a thin wire or, if it’s powerful enough, through the air. In order to generate electricity, we need to create a potential difference. This means energizing or exciting electrons at one point and then channeling them through a conductor to a point where the negative energy is lower. I always like to use the analogy of water to describe electricity. Many of the principles are the same but we are able to see water and observe it, so we understand it better. If we compare water to electricity, we take the pipe that carries the water to be our electrical conductor – the wire that carries the electricity. In order to get water to flow through the pipe, we need to pressurize it. The potential difference is the same as water pressure. Water will flow from a point of high pressure to point of low pressure. So if we look at this example a high-pressure water system is like a high voltage electrical system. We use a pump to pressurize water and this can be compared to the generator that’s used to energize electrons, creating voltage. Before we look at how a generator converts the electron energy of atoms into usable current we need to understand what current is. Again, using water as an example, we can look at how much water we are pumping. The volume of water, measured in liters per minute, will determine how much water we will get from the faucet when we open it. Water can have a high pressure but if it flows through a very thin pipe, we’re not going to get much water on the other end. So, if our pressure compares to voltage, then our volume or water flow is compared to current. Current is measured in amperes (amps). Having a high amperage is like having a high water flow. Now let’s look at wattage. Let’s say we want to use the pumped water to drive a water wheel. The amount of water (volume) will allow us to move a larger or smaller water wheel with varying power. A large volume of water will move a large wheel more easily. Our pressure will determine how fast the wheel turns. We, therefore have a ratio between the pressure and volume that determines what size wheel we turn and at what speed. We can exchange one for the other. If we increase the pressure we will force water through faster. If we increase the pipe size, we will push more water through. So we can increase the power with which we drive our water wheel by increasing either flow or pressure. Using the same principle of water to volts and amps, we can deduce the following: a high current will increase the power with which we turn a motor, a higher voltage will increase the speed. Adjusting the ratio between the two will determine our power output. Electrical power is measured in watts. Power (watts) is equal to the potential difference (volts) multiplied by the current (amps). This gives us the common electrical equation of P=VA (Power equals Volts times Amps). To sum this up, we can look at it like this. Current (amps) is the amount of power we’re using and potential difference (volts) is the strength of the power that we’re using. If we use a stronger power (higher volts) we won’t need as much current (amps) to achieve the same effect. A 12V motor that draws 100A will have exactly the same power as a 120V motor that draws 10A. Using the formula P=VA, this is clearly evident: 1200W = 12V X 100A or 1200W = 120V X 10A. The ratio remains the same even though we’re using a different voltage. Like any equation, the numbers must balance – if we increase or decrease one part of the equation we must adjust the parts accordingly. From the above example, we can look at a generator in the same way as we do a water pump. A pump adds energy to water molecules, causing them to flow. A generator adds energy to electrons, causing them to flow. So how does a generator energize electrons? To understand generators, we first need to refer to another scientific principle that we’ve all been made aware of at some point: energy cannot be created or destroyed, it can only be transferred from one state to another. All generators use motion as means to generate an electric charge. The exception here would be solar panels. Solar panels are not, strictly speaking, generators. They convert light into electricity. In this article, we are focusing on generators so we’ll leave photo voltaic energy (solar electricity) for another time. In order to produce electricity using a generator, we need a few basic things. 1. Fuel : Some form of fuel needs to be used to create motion. The fuel contains potential energy that can be converted into heat. 2. Mechanical Energy : The heat generated from the fuel needs to be converted into motion. For this, we can use an internal combustion engine that uses gas or diesel, or an external combustion engine that uses heated gas to drive a turbine. Examples of an external combustion engine would be a coal fired (steam) turbine, jet (gas) turbine or a nuclear powered (steam) turbine. There are two types of turbine that don’t use a fuel source, these turbines use natural potential energy, namely, wind and water. Hydro electric energy utilizes the power of gravity that causes water to flow downward and wind turbines use the motion of air that’s created by temperature differences on the earth. 3. Alternator : In order to convert mechanical energy into an electric current, all generators use an alternator. Now let’s take these three aspects and look at the process of generating electricity. The first power generators used coal as a fuel source and this remains the most common source of fuel for power stations around the world. With the exception of internal combustion engines, all power stations use the same principle, even if the fuel source changes. This means that a nuclear power station will work in the same way as a coal power station, just using a different source fuel to produce the heat needed. In a coal fueled powered station, the coal is burnt and used to heat water. The water is heated under pressure to produce super-heated steam (steam that is heated way beyond the normal boiling point). The pressure of this steam is released through jets that blast onto a turbine. This is like an incredibly strong gust of wind that’s channeled to an exact point. This will cause the turbine to spin and the spinning turbine drives an alternator. What is an alternator and how does it work? An alternator is used to produce alternating current (AC) by converting mechanical energy into an electromagnetic field. In order to do this, the alternator needs two basic components – a stator and a rotor. The rotor is made up of a conductor (usually copper) that’s wound around a shaft in the same way that an electromagnet is wound. This shaft is connected to a motor that spins it. The electrons in the conductor become energized through the spinning motion resulting in the formation of a magnetic field. This electromagnetic field is transferred to the stator. A stator is a static winding that fits around the rotor but does not touch it. As the field moves through the stator windings it generates a voltage. This process is known as magnetic induction. The magnetic field fluctuates as the polarity changes from positive to negative. This causes the voltage to pulse between a state of high charge and low charge, producing a sine wave. The sine wave is produced as the current builds to a point of high charge and then subsides to a point of low charge – a neutral state. The voltage needs to be regulated in order to keep it constant. An automatic voltage regulator (AVR) controls the flow of the current in order to keep the voltage constant. When the load demand on a generator increases, the voltage will drop. The AVR will increase the magnetic field to meet the higher demand. Conversely, when the power demand drops, the AVR will reduce the energy of the magnetic field. A three phase generator will use six different windings on the stator. Each of the windings are connected in sets of two. If three sets are connected in series, a higher voltage will be produced. If the sets are connected in parallel a lower voltage will be produced. The voltage passes from the generator through a diode to a conductor that transports the current to the point of use. A diode is like non-return valve or “one-way” valve, that’s used to control water flow. The diode is a semiconductor that causes the electric flow to move in one direction, this means that the current has to flow out of the generator into the conductor and not back into the generator. All generators use these basic principles to generate electricity. In our homes, businesses, and RVs, we use a number of different types of generators, depending on our needs. There a few basic categories of generators that are commercially available. While all of these generator types are similar, they have different applications and don’t all operate in the same way. Let’s answer the common questions associated with these electric generators. The term home generator is quite broad but, in essence, it’s used to describe a generator that’s powerful enough to supply the electricity needed to run an entire household. They will switch on automatically when the power fails and switch off again when the mains power is restored. These are the same generators that are used in large buildings, just smaller. A home generator uses an internal combustion engine to drive an alternator. The engine can use either, gas, diesel or natural gas (propane) as a source of fuel. The size of the alternator will vary and can be anything from around 10KW up to 40KW or more. These generators can be single phase or three phase. A home generator is connected to the main power supply in your home via an automatic transfer switch. An automatic transfer switch is an electronically controlled switch. When the mains power is functioning normally, the switch will direct power from the grid into your home. When the mains power fails, the switch will start the generator and then switch the power supply to your home to the generator circuit. You will then be running your home with power supplied by the generator. When the mains power is restored, the transfer switch will switch the power supply to your home back to mains power and switch the generator off. There is always a pre-programmed delay between switching from mains to generator power or vice versa. This is because the household power may switch on and off several times in rapid succession before the supply is permanently restored. Very often, when the mains power first comes on, there can be dips and peaks in the voltage as the grid power adjusts to the power demand. This is why there’s a delay before switching over the power supply. This delay gives the power supply to your home time to adjust to normal voltage and remain constant before turning the generator on or off. Because a home generator has a relatively large generating capacity, it can adjust to changes in demand without disrupting the voltage. The built-in AVR on the home generator will adjust the voltage as demand changes and the sine wave will remain relatively stable. If the demand for power is close to the maximum power output of the generator, the AVR will not be able to cope with changes in voltage when the power demand is high and the sine wave will become distorted. This can cause damage to your electronic circuitry. Home generators require specialized installation. A qualified electrical technician will calculate the maximum peak load requirements of your home and supply a generator that is capable of meeting this demand. For this reason, a home generator will always supply a stable voltage without the load demand becoming too high. As a user of a home generator, there’s nothing that you have to do. The generator will switch on and off automatically and the load will constantly be monitored by a computerized system. You only have to ensure that the generator has enough fuel. Though expensive, home generators are the most convenient power backup systems for the general homeowner. A portable generator is a gas, diesel, or propane powered generator that is designed for portability. They have a fuel tank that is fitted to the machine and are light enough to be carried or wheeled about manually. The power produced by a portable generator can be anything from around 1KW up to around 6KW. Small portable generators can weigh as little as 10-15 LBS, though won’t supply much power. Large portable generators that can supply enough power to keep most household appliances running, can weigh well in excess of 100 LBS. These generators are still considered to be portable, even though it’s impossible for one person to lift them because they will have wheels that allow you to move them about. Because portable generators are not too powerful, they can often run at loads that are close to their peak output. When a generator is supplying a high current (close to its peak output) the power will become unstable and the voltage will fluctuate. Even if the generator is fitted with an AVR, the load can be too great for the voltage to be managed properly. At peak loads, a small generator will not adapt to current demand changes very well and the sine wave will become distorted. This can cause harm to sensitive electronics. A portable generator works in the same way as a home generator. The only difference is that you have to switch it on manually and connect it by either using an extension cord or connecting it to the main power supply of your home through a manual transfer switch. A manual transfer switch serves the same purpose of an automatic transfer switch, you just have to switch the generator on yourself and switch over to generator or mains power by turning the switch manually. Because smaller portable generators are easily affected by changes in load, the voltage that they produce can be unstable. When a portable generator is running at high load, the changes in voltage will result in small peaks and dips in the AC sine wave. This is referred to as harmonic distortion – the sine wave becomes distorted by the voltage changes. An inverter is used to produce a sine wave that is electronically monitored to always be stable. The accepted standard for an inverter that will provide a current that won’t harm sensitive electronics must be able to produce a sine wave with less than 3% Total Harmonic Distortion (THD) at peak load. An inverter generator produces electricity in the same way as any portable generator. This means that it uses an engine to drive an alternator that produces an alternating current. Where the inverter generator differs is in that it uses a rectifier to convert the alternating current into direct current and then uses an inverter to revert the power back to alternating current. In a process known as double conversion. While this may seem like a strange way to do things, there’s a good reason why double conversion is the best way to produce clean power. DC is a very manageable current, this means that it’s easy to control the voltage, DC voltage can, therefore, remain stable as the load changes. An inverter uses semiconductors and transistors to create an AC sine wave from the DC power source. Using a microprocessor, the inverter is able to monitor the sine wave several thousand times a second. If there is any change in the voltage, capacitors are used to correct the voltage. This means that even the smallest change in the sine wave, no matter how quickly it happens, will be detected by the inverter and corrected immediately. The result is a sine wave that is without any distortion, or at least within 3% of THD at peak load. Any portable generator, whether it’s a conventional generator or an inverter generator will require user input to operate it. Not all generators have the same functions. Some may have electric starters, while others may use a recoil starter. A two-stroke generator will require you to mix gas with oil, whereas as a 4-stroke generator only require gas. In some cases a generator will be able to run on natural gas as well as standard gas, these generators are known as hybrid generators. These differences will be explained to you in your owner’s manual, so it’s important to read the manual properly before operating your generator for the first time. Even though generators vary, the basic procedures that need to follow remain the same. Most operating procedures for using a generator focus on user safety, so it’s important to follow these steps properly. Before you start using your generator, you need to place in the correct position. A generator needs to stand on a level surface so that it won’t tip over easily or leak fuel from the gas tank. An important consideration when placing your generator is ventilation. The engine needs adequate ventilation to prevent it from overheating. Exhaust fumes also need to escape. Exhaust emissions are very dangerous if inhaled by humans or animals, so make sure that the generator is never in an enclosed space close to you or your pets. The generator also needs oxygen as part of its combustion cycle, this means it must have a fresh air supply to the air intake on the carburetor. If your generator is going to be used in an enclosure, this should be built for that purpose and allow for adequate ventilation for both cooling and clean air intake. For the sake of convenience, most people will place their portable generator outdoors. This is fine as long as the generator is not exposed to water. Leaving a generator out in the rain is extremely dangerous. Even if the generator is kept from the rain, care must be taken to avoid water flow that may come into contact with the generator. An outside porch that is protected from the elements is an ideal place to position the generator. When you’re ready to start your generator make sure that there is no electrical load on the generator. It’s best not to plug anything into the generator before starting it. If your generator is connected to a transfer switch, make sure that the switch is not in the “generator” position when you start the generator. Starting the generator is the same as starting any gas powered machine. There’s usually a switch for run/stop and some may have a fuel supply switch or tap. With the fuel supply open, the operating switch in the run position and the choke set to the correct position for the weather conditions (in hot weather the choke is seldom needed), you start the engine either by pulling on the recoil starter or turning the ignition key if the generator has an electric starter. Once the engine starts, give it a little time to adjust to the right revs. If you’ve used the choke to start the engine, allow the engine to warm up to a point where it runs normally with choke off before proceeding. When the engine is idling normally, you’re ready to connect your power cable to the generator. 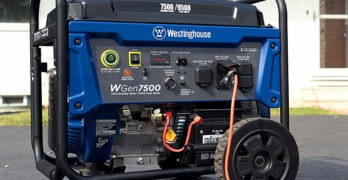 If your generator is fitted with a voltmeter, it’s a good idea to check that the volts are correct before connecting your power supply cable. Plug in your extension cord to the correct outlet and, if the generator has power on/off switch, switch the power on. Never add fuel to your generator when the engine is running. Always switch off the generator before filling the gas tank. Never use a damaged extension cord with your generator. Never run your generator at more than 75% load for extended periods of time (30 minute or more). This can easily cause the generator to overheat and may result in permanent damage and possibly become a fire hazard. Always use the specified fuel octane and oil type for your generator. Keep your generator serviced in accordance with the manufacturer’s specifications. Always use your generator in a properly ventilated area. Be careful of touching the engine or exhaust when the generator is hot. Never allow your generator to come into contact with water when running and never start your generator if it’s wet. Don’t place the generator close to flammable materials. Learn more by reading our article on Solar Generators.